When I started this blog one of the rules I set myself was only to publish information I was sure was correct, and if I was unclear on a point I would make that clear in the post. In the case of arms identification I feel it's very important to be 100% sure about what you are posting, especially when so many people read and share what you are writing. Unfortunately it seems for some people writing about arms in Syria all you have to do is take a few videos and work up a story without having any real understanding of what you are looking at, with this latest article by Theodore and Walid Shoebat for Frontpagemag.com being one of the worst examples I've seen so far in this conflict. The article starts by reminding the reader of their earlier "scoop", where they "revealed that the Syrian rebels had in their hands potent chemical weapons and were testing them on rabbits". This video did the rounds a few months ago, and show a man with the flags and various paraphernalia of the Free Syrian Army with a collection of chemicals, making various threats to the Syrian governments and various minorities, and then poisoning a rabbit with an unidentified gas. The video was originally posted on a channel that wasn't established as being used by any activists or armed groups in Syria, and is of questionable authenticity. Despite this, Theodore and Walid Shoebat seem convinced this is the work of the Syrian opposition, despite the lack of evidence to support that theory. 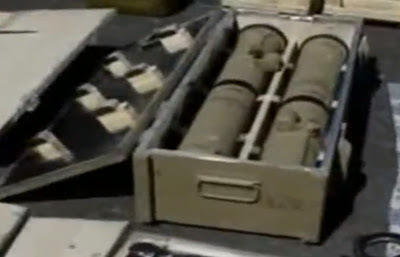 We have captured clips that were never translated (until now) showing rebels revealing heavy arsenals including weapons of mass destruction that contain chemical agents. They ask "how can an FSA reporter film an exploded chemical rocket at a close distance and remain alive? ", a claim made by the man filming the smoke. My answer would be that the average Syrian doesn't know anything about chemical weapons, and this is very likely a thermite based ZAB incendiary bomblet or a cartridge from a ZAB 100-105 incendiary bomb burning off, both of which are used widely in the conflict. But again, it's a fair question to ask, even if the authors seem unaware of the possible answers. They follow this question by stating the following video shows the Syrian rebels have captured a "substantial amount of scud missiles"
The video has been helpfully translated by the authors, but it should always be remembered that, as demonstrated in the previous video, the people filming the videos don't always know what they are talking about, and anyone seriously investigating the use of arms in Syria should be writing about what they see, not what the people in the videos are saying they see. Next the authors take a look at a video of a Scud launch, stating "And just when you think that these rebels are too primitive to figure out how to fire these missiles, here is a video of them actually launching one"
While in this case it's an actual Scud missile when it was originally posted on Youtube by Syrian activists it was claimed this was a clip taken from the Syrian army, and there was a great deal of debate about it's authenticity, with a number of people claiming this was from an earlier military training exercise. 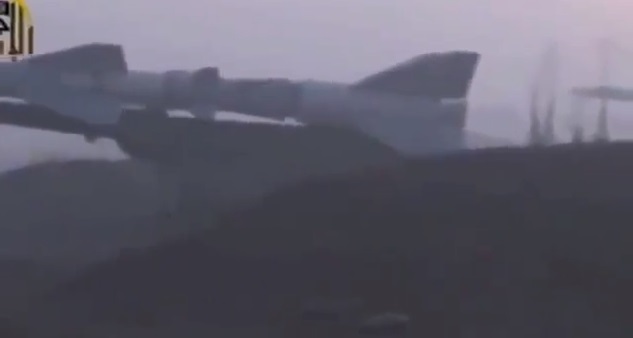 Of course, there's no way to know the exact origins of this video, but there's no way to any serious person could state with 100% certainty that this is the Syrian opposition launching the missile, and certainly wouldn't use it as the basis of making such a serious claim about the Syrian opposition's capabilities. Now if you look at the history of chlorine being used in recent conflicts the one series of events that stands out are the chlorine bombings in Iraq from 2006 onwards. One thing to note about these attacks were they were all ground based attacks, a variety of IEDs and VBIEDs, and only in the largest examples were there the same number of injuries and death seen with the Khan al-Assal attack. These attacks used massive amount of chlorine gas with explosives, with many deaths coming from the initial explosion rather than chlorine gas. So it would seem that to produce the amount of injuries and deaths seen at Khan al-Assal a massive amount of chlorine would have to be delivered, far greater than could have been delivered by a DIY rocket, especially if it's the chlorine is suspended in liquid. It's fair to say that the claims made about the Khan al-Assal attack are highly questionable, and will no doubt face great scrutiny by people who specialise in the area of rocketry and chemical weapons, but I think it's fair to say the authors themselves are not experts in these areas, nor have they spoken to experts in these areas. One thing I have been following closely are the various DIY weapons used in Syria, and looking at the DIY rockets I've seen used, most of which are about a meter or two long, and would have trouble going 4km, let along 40km, I would be stunned if they had suddenly developed an accurate rocket capable of reaching a distance of 40km, especially one that was able to carry a warhead large enough to cause the deaths and injures seen in Khan al-Assal. I'm happy for anyone to prove me wrong on that point, and if they can I'll dedicate a new post to this amazing new development in DIY rocketry in Syria. In conclusion we have a selection of videos that don't support anything the authors claim, along with a few theories on the Khan al-Assal attack that don't really seem to be based on much more than claims made by the Syrian government and an extremely limited understanding of the DIY weapons used by the Syrian opposition and chlorine based weapons, not really something I would personally feel that proud about putting online for the world to read. In recent weeks I've been tracking the spread of arms purchased from Croatia by Saudi Arabia which were then sent to what were meant to be moderate Free Syrian Army groups via Jordan. Already there's been examples of groups such as Ahrar al-Sham and other militant Islamist groups using these weapons, and there's now evidence that Jabhat al-Nusra has been using these weapons. This first image of a M79 Osa titled "One of JAN lions fighting to liberate Alsahweh brigade", taken from this Jabhat al-Nusra statement, comes from a joint operation with other opposition groups to capture a military base outside of Al Sahweh, Daraa that took place in the middle of February, and involved a number of groups using a large number of weapons provided by Saudi Arabia from Croatia in the battle. The second image is taken from this report, and shows a M60 recoilless gun being used to attack an army outpost, Hajez Barad, in Busr al-Harir, Daraa, on March 2nd. From late December 2012 onwards Busr al-Harir has been the scene of heavy fighting when multiple opposition groups attacked Syrian army forces in the town using large numbers of the Croatian weapons provided by Saudi Arabia. In both cases multiple opposition groups were involved with the fighting, many of which were the original intended recipients of these weapons, so it's possible that Jabhat al-Nusra received these weapons from those groups during the battles. It's unclear how many weapons they received, but it'll be another aspect of the Croatian arms story I'll be tracking in the coming weeks and months. Thanks to @troublejee for his help with this piece. 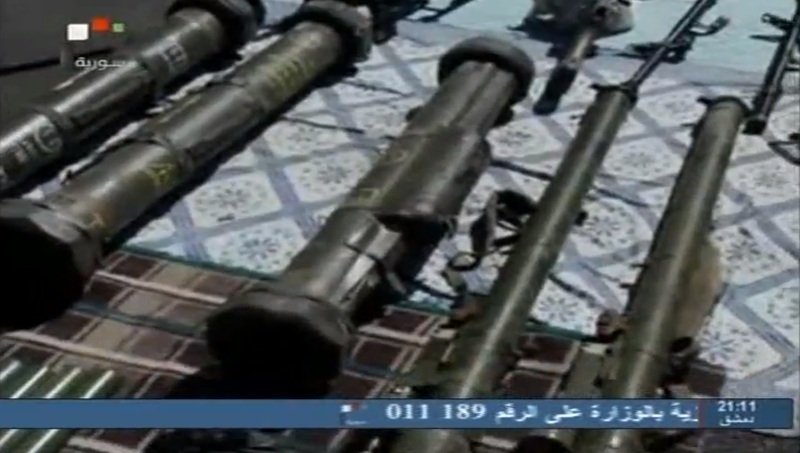 Update March 28th 2013 This video from Al Jazeera Arabic shows a M79 Osa in the hands of Jabhat al-Nusra in Damascus. The below video from Syrian State TV shows various weapons and ammunition reportedly captured from opposition fighters in the Hama region. 1 - The octagonal end piece. 2 - Dark red stripe. When most followers of the various Arab Spring conflicts think of MILAN missiles they will probably think of the MILAN AT missiles provided to the Libyan rebels by Qatar, and seeing the same types of missiles apparently appearing in the possession of the Syrian opposition will also probably make them think about reports of Libyan arms being sent to Syria. However, it's important to understand that not only does the Syrian military use MILAN missiles, but so do many other countries in the region, including Syria's neighbours Iraq, Lebanon, and Turkey, so although it's the first sighting of these weapons in the conflict that I'm aware of, it cannot be assumed these are being provided the the opposition from abroad. All four videos were posted in that last two days, and I've been unable to find earlier videos showing Croatian weapons in the Homs region, so it appears these are all new arrivals in the Homs region, and it will be interesting if these weapons have the same significant effect in Homs as they've had in Daraa. In the case of the first three groups it cannot be said that these groups are what would be considered "moderate Islamists", and they certainly aren't part of the Free Syrian Army. What this yet again highlights is how despite the best efforts of those providing the weapons from Croatia it's really impossible to ensure these weapons don't spread beyond the groups they are intended for, especially when many Free Syrian Army groups fight alongside groups outside of the Free Syrian Army on a regular basis. As an aside, it's also worth noting the large amount of ammo captured today at Khan Touman, including crates full of 122mm grad rockets, AT-3 anti-tank missiles, and other unidentified crates of ammo. Big thanks to Charles Lister for help with this post. It's also worth noting that this is by far the furthest north I've seen any Croatian weapons that have been involved in fighting in Daraa and Damascus. The following is a list of Syrian Bambuser profiles, Youtube channels, and Facebook pages sorted by order of district and town/city whenever possible. To my knowledge the channels I've listed are used by activists to upload videos, and are not channels that repost videos from other channels. Collected Live Streams from across Syria can now be found here. These list are by no means complete, and I'm always looking for suggestions for additional channels and any corrections. You can comment below, or send me suggestions and corrections to my email or Twitter account. Hackgate - Elveden: Murdoch Or King Cnut? 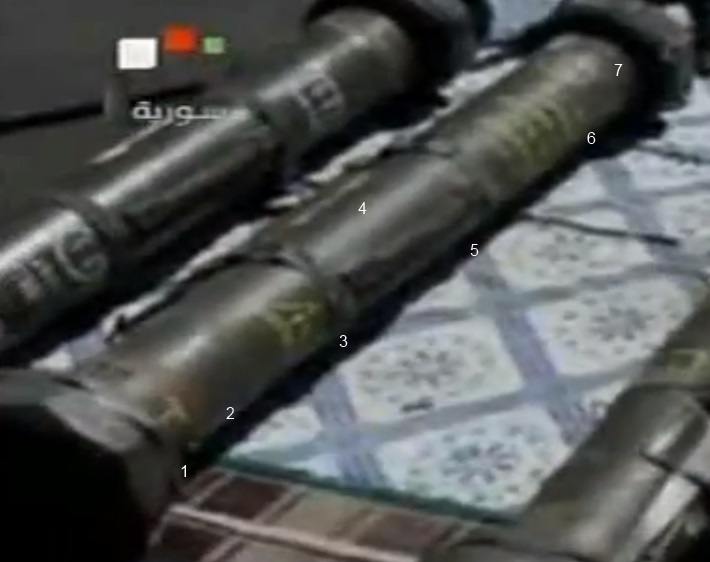 Chinese MANPADS In Syria : Does 2 + 2 = FN-6?